Beautiful residence in a vast nature reserve. You enter the villa with 300 m² of built area on the top floor, either through the entrance with outside stairs from the west, or you can go directly through the concrete driveway to the main entrance. After entering the reception area through the hallway there is a spacious living room on the first floor with fireplace and dining area and an inviting lounge area flooded with lights entering through the windows of the living room. Through an archway you enter into the TV room with library. Adjoining this room is the fully equipped kitchen built of wood, where there is also a bright dining area. From the library you can access the largest of the three bedrooms, which has an adjoining en suite bathroom. The second bathroom, with a bath tub, is located opposite to the two additional bedrooms. The living area is complemented with a spacious laundry room, where there is washer and dryer. The entire living area including the bedroom is designed with wooden parquet. Kitchen, bathrooms and utility room are tiled. Apart from the fireplace in the living room the house also has central gas heating. All carpentry, windows, doors and their frames as well as the elegant built in cabinets are made of wood. The large terrace area around the top floor is partly covered. The wellness and recreational facility is in the ground floor. Starting with a heated indoor swimming pool 4 x 8 m, which has a private guest bathroom with its impressive glass door on the front, the from which you can get in to the surrounding patio or lawn on the ground level, via the spacious game room with pool table and finally the bar, which is especially welcoming with its cosy sitting area to relax. Adjacent to the main house El Pinar on the property there is a gorgeous guest house Casa Roberto with 6 additional beds available on request. The usage of Casa Roberto is optional and not included in the rental price mentioned. Powerful Wi-Fi network in the entire house. Several dining areas inside and outside. On the property there are also three vintage cars from the early 20th century and an enclosure with 40 sheep, chickens and Artos the pot-bellied pig. The animals can also be petted and fed. We, a family of 4 with kids aged 9 and 7 years old had a wonderful time at the villa. Location on the island is perfect. Everything is within acceptable distance. Especially the west side of the Island with the best weather and nicest hikes and beaches (Tazacorte, Porte Naos). Hiking into the Taburiente Caldera and swimming in the Caldera stream was a wonderful experience for us and the kids (notwithstanding the 5 hour, 13.5 km hike...)! Beringoyo mountain and viewpoints from Cumbrecita (which is a 15’ drive from the house we’re other highlights. Further, the house is very comfortable and well equipped. However, the property is so extensive that the owners have a hard time maintaining it. It’s perfect now, but needs some care. In the end, we recommend the hous to couples, groups of friends and families! El Pinar is an amazing place to relax and unwind away from it all. We stayed for 14 nights (family of 4 with ‘kids’ of 17 & 19). The property is spectacular. Right from the arrival and steep winding driveway that greets you through the electric gates it makes you realise this is no ordinary villa! The grounds are superb. Beautifully maintained and you feel surrounded by nature amongst the pine trees. The downstairs games room and swimming pool area is fantastic and we spent many enjoyable hours there. The tennis court is also a welcome additional activity. The setting is excellent in the National park with the visitor centre literally just down the road to provide good advice for sightseeing and walks and the Cumbricita viewpoint is also very close by and worth a visit with a number of treks available from there. The clear night sky is fantastic although there were a fair few cloudy or hazy days too so when it’s clear we just ‘went for it’ and drove to a nearby viewpoint. La Palma is apparently the ‘steepest’ island in the world! That does mean lots of windy roads - great fun to drive but just need to allow more time to go relatively short distances. We enjoyed the local port at Tazacorte with good options for sea kayaking or boat trips and a wide black sand beach. We drove to the top point of the island (Roque de los Muchachos) and the views were good but cloudy. On a clear day they would be truly magnificent. We also trekked part of the way from the El Pilar recreational area along the Ruta de los Volcanes which gave us some fab views across both sides of the island. So many other places to visit and we’d love to return some day! Big thanks to Mike who looks after the place and is an excellent host - there whenever needed but not at all intrusive. We had a delightful stay in this villa, the owners have provided everything necessary for a stress free stay. A special mention to Mike (jack of all trades) for his assistance when needed and invisibility when not. Thank you to the owners for sharing this fabulous property with the world. Lovely villa with all the amenities. The property is essentially a botanical garden requiring three gardeners to maintain. Oranges ripe for the picking right on the driveway. The property is surrounded by nature and very close to good hiking trails including the caldera at the volcano yet also a short 5- 10 minute drive into El Paso and an easy drive to the coast further west. There is one other villa on the property as well as an assortment of sheep and chickens so you are not totally isolated but definitely away from the 'maddening crowds'. Stunning location, lovely timeless property. with Canarian natural stone guest house. The Villa is located close to the Caldera de Taburiente national park. You enter the villa with 300 m² of built area on the top floor, either through the entrance with outside stairs from the west, or you can go directly through the concrete driveway to the main entrance. The property is located on the outer circumference of Caldera, in the pine forest of Valencia, located at about 900 m above the sea level.The whole plot with approx 45,000 m2 fully fenced nature reserve is designed with numerous ornamental plants and partially with lawns as a garden. The property is centrally located on the sunny west side of the island with the impressive mountain scenery of Cumbre at the back and a beautiful view of Adrianetal and the sea. In a few minutes you are in the centre of El Paso, a place where traditions are still maintained, people love festivals and the old men relax at the bar. You should drop in there for a coffee or 'copa de vino' and experience the quiet bustle. It also has everything you need, supermarkets, many small shops, a German bakery, organic food stores, magazines and of course even more bars and nice restaurants with a friendly Palmerian atmosphere. It takes only 30 min to the capital Santa Cruz and to the airport. To Los Llanos, which is the 'secret capital' of the west, it takes 10 min and 20 min to the beaches. The highway starts off here, which connects east and west, leads past El Paso, even the romantic Carretera San Nicolas to Tacande starts off here, which leads to the south. From the front door, one can start hiking directly or biking (e.g. 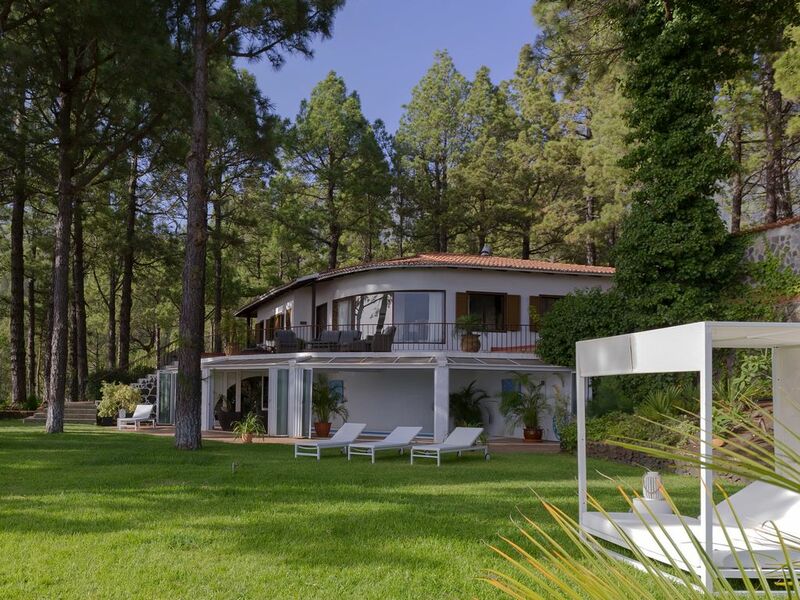 on the Bejenado), it leads past a posted hiking trail or you can simply stroll off, past the lovingly maintained Canarian gardens and houses, you will find meadows with horses and goats, and the wooded slopes of the Cumbre. A gem for nature lovers and those seeking peace! Children under 3 years free. Additional discounts from 20 percent for early booking (180 days or more). Additional discounts from 15 percent for long stays (from 28 days onwards). Please ask! In case of additional discounts the full price has to be paid in the moment of booking and will not be repaid in case of a cancellation of the reservation. For the final cleaning and maintenance of the house, an additional rate of one day is charged. The temperature of the indoor pool is 21 ° C and is included in the rent. All prices are subject to changes.